It has been almost two weeks since I posted on my blog. Work and holiday have gotten in the way of posting content I that I think is worth reading. I have always been against posting content from others for the sake of posting. I am not a content aggregator. Two posts today: one on the market and one later on content delivery networks (CDNs). The past week was interesting with a European bank borrowing some short term funds, Verizon labor union on strike (note they are returning to work as they are apparently closer to a new deal), hot CPI reading, horrible Philly Fed number and so on. I occasionally glanced at CNBC during the week and heard a number of people claiming it is not 2008. In 2008, Verizon juiced CAPEX in the 1H because of a pending labor disruption. Looks like VZ did the same in 2011. In 2008 counterparty risk concerns put fear into the markets. Ditto for 2011. In July 2008 Chris Cox, head of the SEC banned short selling of banks. In 2011, the Europeans did the same. How is it different? 1. Hope is not a strategy. That is how I think of the strategy that Bernanke-Obama-Summers-Geithner deployed in early 2009. Launch QE1 and later QE2. Force the US banks to capital raise (that was good), insert a large stimulus into the economy (not so good) and force the economy to generate momentum sooner and achieve break-out speed (i.e. hope). I think forcing the banks to raise capital is good, they put a floor under various asset classes with QE1 and QE2, but the economy has lagged and that is the problem. We had a credit crisis and we are still impaired as we have not cleared the bad credit; just my simple way of looking at it. 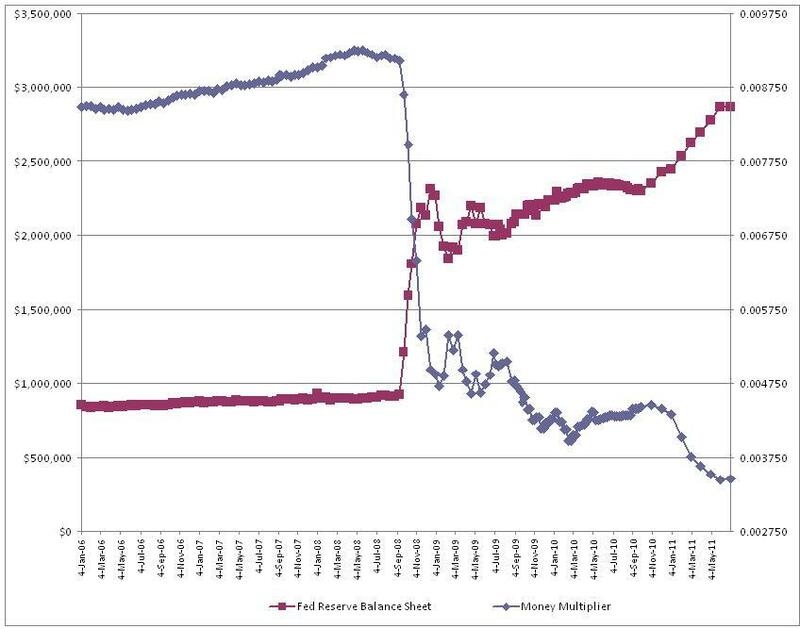 Here is a chart that shows M2/Monetary Base as reported by the Federal Reserve in H.6 and H.3 reports to produce a money multiplier. I also added the Fed’s reported total assets. Bloomberg does a similar calculation here. As an equity investor I want to be able to model the forward business expectations. Kind of hard to draw positive conclusions from that chart; which is the reason why many economists have reduced their GDP models. Here is a simple rule to remember: GDP declines, EPS expectations are reduced and multiples contract. 2. I still hear and read people saying the market is cheap. I ask what is the EPS expectation for the SPX, various indexes and individual equities? If numbers are being cut, how is the market cheap? I think there are aggressive cuts coming to earnings expectations for equities and if this is true the market is not cheap – it is figuring out the new multiple and this will produce big swings until the new consensus is formed. 3. I read various reports over the past week on the risks of a global recession (Joachim Fels) as well as sector notes on tech saying that enterprise and service provider spending is slowing down. One report blamed it on (i) European stresses, (ii) Federal spending slowdown and (iii) deteriorating macro conditions. Again, it really does feel like 2008 and I am not saying the SPX is going to 750 – but it seems we transferred all the private sector stresses of 2008 to the public sector and three years later we are still dealing with the stresses of an unresolved credit crisis; it is just infecting governments instead of corporations. If you are still reading at this point, I started thinking along above lines back in May. In early June I was worried about the three dislocations meeting and they did. By mid June I thought I could connect the dots and this was validated. More evidence of this mess emerged in July and I thought it was folly to invest through the July earnings cycle.